For the full experience of Glacier, bringing along family passports will allow you to travel through the Canadian border. It's not a must but could come in handy if you have extra time. Food, water, small first aid kit and maps (you can't rely on your phone or GPS in some of the areas) are wise to bring. Bear spray is a must. Many hotels in the area offer it for free. Ask at the front desk. Ask the ranger at entry points if any areas have had reports of grizzly bears. Avoid those spots. Don't wander onto roads without specific signs. We found an intriguing side-road off a trail near Lake McDonald and decided to be adventurous and drive down it. Thirty minutes later, after driving through rocks on a one-lane road, we found ourselves in the middle of nowhere and had to back-track. Mornings or late afternoons are best for avoiding crowds. Weekdays are better than weekends. Road construction may slow you down. Expect to stop. Unroll the window and enjoy the sounds and solitude of the scenery. The most popular and brilliant pass, Going-to-the-Sun Road, may be closed as late as June and as early as September due to weather conditions and road construction. Entry to the park is $20 per vehicle. We purchased an $80 National Park Pass that is valid for all U.S. parks for a year. You can get combined passes for Glacier, the Grand Tetons and Yellowstone for a reduced rate. Many hotels have free bear spray at the front desk since it cannot be transported on a plane. If you aren't flying, ordering ahead of time can save as well. 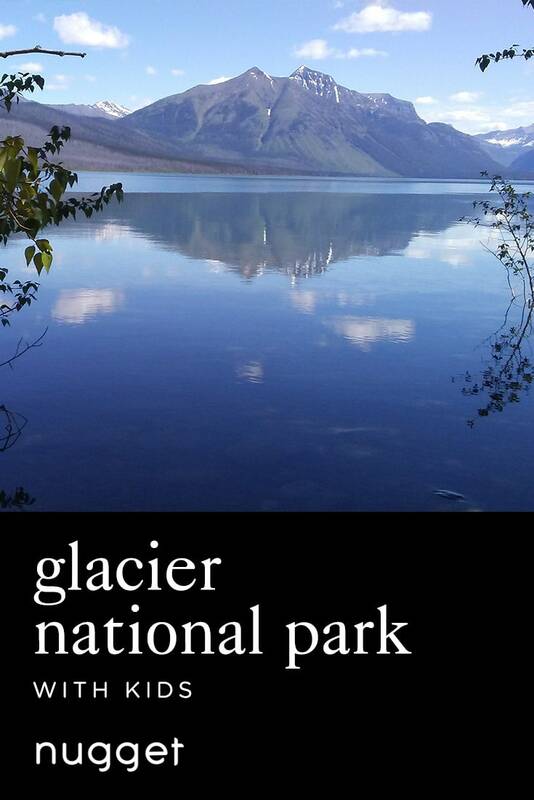 This easy family itinerary of Glacier National Park is centered around Lake McDonald. Start by testing the lake’s glacial waters, and then have a picnic on the beach. Take your kids on a short relaxing hike to beautiful McDonald Falls. If they’re older, try the more rigorous trail to the stunning Avalanche Gorge. Have your passports handy? Then treat your family to a visit to the Canadian side of the park. The multicolored stones in Lake McDonald can be seen in its crystal clear water, and the view of the snow-capped mountains is pretty stunning. The beachy outcropping we chose was well away from the lodge area, and is less inhabited. The lake was shallow enough to wade into the first few feet, but extremely cold. We picnicked, taught our girls how to skip stones along the silky water and took turns seeing who could freeze their toes the longest in the cool lake. I haven't seen my nuggets so engaged in the moment for quite a while, which allowed my husband and I time to relax and soak in the beauty. DIRECTIONS From the West Glacier side, head into the park, towards the Apgar Visitor's Center. Follow Going-to-the-Sun Road along Lake McDonald. To your left are numerous pull-off areas, where you can park and view the lake. The best was near the south end of the lake, about 4 miles (6.4 kilometers) from the visitor center. After parking, go through the tree line, pass a park bench, look to your right, and you will see a sandy area jutting into the lake, just a few feet away. The actual coordinates are 48°33'33.4"N 113°56'20.3"W.
TIP Keep a constant eye on children who may wander because they can easily walk right into the lake. There are no restrooms at this spot so make sure you get that done at Apgar first. This easy walk through the forest lets you feel like you are immersed in nature without investing too much time and energy. It leads directly to McDonald Falls within 10 minutes. There are enough people enjoying this simple hike that we didn't fear wildlife, but traffic was still spaced out enough that we generally walked alone. Although you can follow the trail from either trailhead further than just the falls to experience the convergence of Johns Lake and Lake McDonald, we took this shorter entrance to visit McDonald Falls. We played along the banks at a safe enough distance from the river to keep from falling in, marveled at the frothing light-blue water and simply enjoyed the smell of the cedars and sights of the forest. DIRECTIONS There are several trailheads to Johns Lake Loop. The first is on the right (east) near the north end of Lake McDonald. We passed that one, took a left onto North Lake McDonald Road, crossed a bridge and parked by the second Trailhead Johns Lake Loop sign. TIP Even though there are people in this area, I kept bear spray strapped to my belt for quick grabbing. I never felt afraid but remained cautious. If you keep your group relatively close together, make noise (never a problem for us) and don't hike with loose food, you should be fine on these types of trails. Keep kids away from the river's edge; the current is fierce. This stroller and wheelchair accessible raised boardwalk takes you through hemlocks and cedars. Eventually, it leads to Avalanche Creek, a rigorous hike that is not stroller friendly. However, if you can't make it that far, you can still enjoy stunning views of the Avalanche Gorge. DIRECTIONS The Trail of Cedars is about 5 mi (8 km) east of Lake McDonald Lodge. TIP Come early! We arrived around 11:30 a.m. on a weekday and there was no parking so we didn't actually get to hike this area. If you plan to venture toward Avalanche Creek and even Hidden Lake, bring plenty of water, bear spray and protein. If Going to the Sun Road is closed (as was in our case), there is even a greater risk that the parking lot will be full. WE LOVEDFree dinner on weekdays and free breakfast every day. Staff went above and beyond my gluten-free needs. Heated pool and hot tub.